The greenest government yet? Sadly yes! 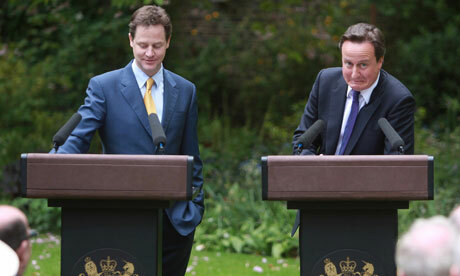 This coalition government set out to be “the greenest government yet“. Sadly, it appears to be achieving this. Not because of any amazing policy initiative but more out of an utter failure of New Labour to act on climate change. The over-riding message coming out of this government is we are acting “Green”. The over-riding message coming out of NGO’s is “good, but you desperately need to go further”. So what have the coalition achieved so far? 8 Lobbying the EU to increase our emissions cut target from 20 per cent to 30 per cent and provided effective leadership at Cancun. This government has done more in 6 months than Labour achieved in 13 years to tackle climate change. Yet, anyone who is aware of the severity of the problems facing the UK through climate change can see that these measures simply do not go far enough. The Green Investment Bank for example is a good idea, but it needs investment 4 – 6 times the amount currently being proposed to be truly effective. This is the greenest government yet, that I have little doubt. To be able to mutter this statement though is a cause for Labour to hide in shame, not for the coalition to hold its head up high. We need to congratulate the coalition on the steps they have taken and push them further – much further. First of all, to condemn the current government’s inaction on climate change does not need to let Labour off the hook. New Labour, has failed on the very core principles that they claimed to represent in 1997. They promised a 20% reduction in GHG emissions in fact we saw a rise (and then they hid behind the de-industrialisation of Europe to claim action). They promised by 2010 that 10% of our power would come from renewables, whilst in reality on 3% does. They promised a transport revolution moving people away from cars and towards public transport and electric cars, and in reality we saw a 10% increase in car journeys. To simplify, I will accept criticism of the current government’s plans, but will not (cannot) accept a defence of New Labours legacy. You are right however to point out that some of the list is a continuation of Labours plans (like the RHI). Though, you have to understand this in a context of the most severe cuts this country has ever seen. By keeping this sort of initiative in, the coalition is highlighting that they consider it to be more important than the multitude of other things they have chosen to cut. The GIB – as far as I am aware it has not been downgraded (although I believe the treasury to be lobbying it). I think (although not sure) I am right in saying that we will have to wait and see if DECC can stand up to the treasury on this issue. The government announced last week that they are pushing ahead with the emissions standards (set at a level where traditional power stations would not be able to operate). But again, it’s an example of a good idea not going far enough. It was promised to be set at the level of a modern gas powered station; these standards have been dropped to include a coal power station with a small amount CCS technology. In terms of feed-in-tariffs – the speculation that they were going to be cut seems to have disappeared. In the spending review they were specifically protected. We are waiting more detail on what will happen in the 2013 review (which was scheduled to happen any way). The gov’t is reserving the right to cut rates as the up-take has been higher than they expected. But, for now (the next 2 years) there will be no change in the scheme. Ummm….. You would not expect me to defend Labour’s dismal record, but I think a bit more rigorous analysis would do the topic justice. I don’t recognise everything on your list as actually happening, the so called Green Investment Bank I believe has been downgraded to a ‘Fund’, the Warm Front insulation grant scheme has run out of money and is not accepting new applications until April, not sure the 100,000 jobs are new or actually exist, I don’t think there is and longer a stipulation for new coal power stations to be carbon capture ready, there is a promised review of feed-in-tariff rates that may well mean cuts to one of the things Labour did do….. I am not sure how many of the things you list are really new or are basically continuation of the plans/programmes from the last government. My understanding was that the RHI was always in the pipeline scheduled for April 2011.